This is the terrifying moment a man wielding a cleaver grabs a woman in the street and threatens to cut her throat before being tackled to the ground by police. 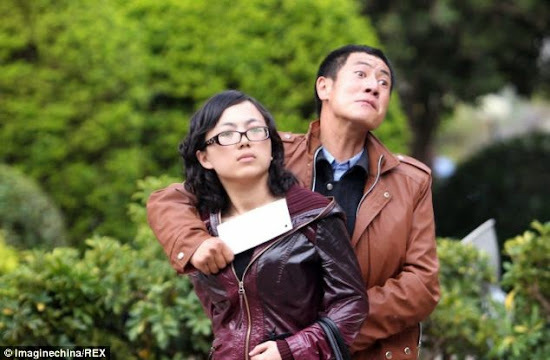 The woman was grabbed by the knifeman at the Kunming News Center in China's south west Yunnan Province earlier today. The cleaver was then held against her neck, with the man threatening to cut her throat. Police were called to the scene and cordoned off the area before trying to negotiate with the man. But he failed to surrender the frightened woman and police acted by tackling him to the ground. The man was then detained by the police after the one-hour standoff. The female hostage was then freed but fainted due to the terrifying incident and was immediately rushed to hospital. A police officer was also wounded in the tackling the man and sustained injuries to his right hand. The case is being investigated by the police and it is still unknown why the man took the woman hostage.